Shortly after 11 a.m. Sunday morning, Nashville police say multiple victims were shot at the Burnette Chapel Church of Christ in Antioch just south of Nashville, according to a dispatcher. Police have confirmed that one woman was found dead in the parting lot. • Six other people, in addition to the shooter, are being treated for injuries. • All the injured are being taken to local hospitals for treatment. • Police says all but one of the victims are over the age of 60. • The attendees who were not injured have been taken to a safe location, police say. • The church has a weekly service beginning at 10 a.m. It's unclear whether the service was ongoing, or had just ended when the shooting occurred. • Police have not released identities for either the suspected shooter or any of the injured parties. • The church is led by Joey Spann. According to a former pastor at the church, Spann and his wife were among the injured. Officials with the Metro Nashville Police Department identified the women killed as 39-year-old Melanie Smith from Smyrna. Smith was the was walking to her vehicle. She died at the scene. Authorities said the gunman, later identified as 25-year-old Emanuel Kidega Samson, arrived in the parking lot in a blue SUV. He was reportedly wearing a neoprene half face mask. Reports stated Samson, who moved here from Sudan in 1996, has been living in Murfreesboro. He was a legal US resident but not necessarily a US citizen, according to police. Samson first came across Smith in the parking lot. After shooting her, police said Samson then entered the church through the main sanctuary door with two guns and fired multiple rounds. He's facing charges of murder and attempted murder. Before 25-year-old Emanuel Kidega Samson opened fire on churchgoers in Antioch, Tennessee today, he shared a variety of Black Power and anti-police propaganda on his personal Facebook page. In addition, he shared a number of pro-Islamic posts, including a video in which a Muslim activist defends Sharia law. Moreover, Samson frequently shared anti-west posts, at least one of which praised Zimbabwean dictator Robert Mugabe’s wealth confiscation efforts. Hard to KNOW what to file this case under? A combination of all 7? Local resident (witness) Joe Love: ""He shot the lady in the back and then rolled her over and shot her in the face......he shot her like she was a damned dog in his backyard"
Rumpole, What case to file it under? I will go with any/all of the first six you listed. The left will file it under SIMPLY INSANE. But WE all know better. Police said Samson was transported to Vanderbilt University Medical Center where he was guarded and treated. He was released from the hospital and placed in police custody where he was then transported to jail. Metro Police said he will be charged with one count of murder. Multiple additional charges were pending. Four guns thought to be Samson’s were recovered by police - two pistols from the church, and one pistol and one rifle from his SUV. The motive for the shooting was still being investigated. Court date is October 6. NASHVILLE, Tenn. — Metro Nashville Police said Wednesday the shooter legally purchased one of the guns used in last weekend's mass shooting and was given the other three from a relative. 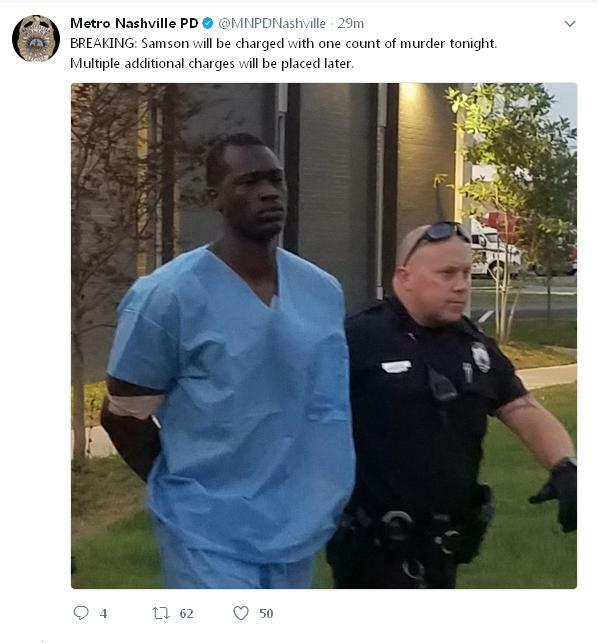 Police said the suspected shooter Emanuel Samson purchased the .22 caliber pistol, later found in his car, from a store in Rutherford County in 2015. A relative interviewed by law enforcement said the other three guns found at the scene were given to Samson for safe keeping. The gun used in the shooting, a .40 caliber pistol, was purchased from a retailer in Rutherford County in August of last year by the relative. That relative also purchased the AR-15 rifle at the same retailer in February 2014 and the 9 mm pistol in Wilson County in August of last year. Metro Police said they are still investigating the motive for the shooting. Samson has previously attended the church when he came to the U.S. from Sudan but had not been an active member in years. NASHVILLE, TENN. - A note found in the Nissan Xterra of a man charged in a deadly Nashville church shooting referenced retaliation for a white supremacist's massacre at a black church two years ago in Charleston, South Carolina, law enforcement officials told the Associated Press. Police say Emanuel Kidega Samson, 25, fatally shot one woman and injured seven others in an attack Sunday at the Burnette Chapel Church of Christ. While police have not released a motive for the attack, the note could offer a glimpse into his mindset. The Associated Press in Washington, D.C. has not viewed the note, but it was summarized in an investigative report circulating among law enforcement. The report said that "in sum and in no way verbatim," the note referenced revenge or retaliation for Dylann Roof, the white supremacist who killed nine black worshipers at a South Carolina church in 2015 and has since been sentenced to death. It wasn't clear what Samson, who is black, is alleged to have written about the Roof shooting, or whether his note contained other details that might also speak to a motivation or state of mind. Today's preliminary hearing was continued until October 23, 2017. "Police haven't determined a motive." 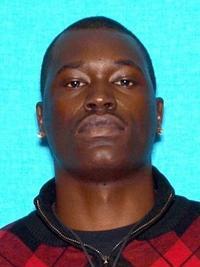 ANTIOCH, Tenn. (WKRN) – The accused Antioch church shooter’s case was bound over to a grand jury early Monday morning. Emanuel Samson was initially scheduled to appear in court but waived his rights. Despite his decision not to appear, the man who confronted Samson testified, as did a Metro police officer, revealing more details of the shooting. “I seen the shooter come into the building and waving his weapon around, and then I seen him discharge at the preacher,” his testimony continued. Engle, 22, bravely confronted the gunman after the pistol-bearing man opened fire on the congregation at Burnette Chapel Church of Christ on Sept. 24. One person was killed in the shooting and six others were injured. Samson is charged with murder, and additional charges are expected. He is being held without bond. A motive for the shooting still has not been determined. March 19, 2018: Samson was indicted on 43-counts, including charges of first-degree murder, attempted murder and felony civil rights intimidation. NASHVILLE, Tenn. — A Black man accused of fatally shooting a white woman and wounding six other people at a Tennessee church in September pleaded not guilty through his attorney Wednesday to charges in a 43-count indictment including first-degree murder, attempted murder and felony civil rights intimidation. In Davidson County Criminal Court, attorney Jennifer Thompson entered the plea on behalf of 26-year-old Emanuel Kidega Samson during the arraignment on charges in the Burnette Chapel Church of Christ shooting in Nashville. Samson was not in court Wednesday and has not yet appeared in court. He was indicted this month. Nashville District Attorney Glenn Funk's office on Thursday announced prosecutors will not seek the death penalty against Emanuel K. Samson, the man accused of killing one person and injuring several others at the Burnette Chapel Church of Christ. Instead, Funk's office said in a statement, Funk will pursue the "enhanced penalty" of a life sentence without the possibility of parole for the first degree murder charge facing Samson. If convicted, Samson could face additional sentencing for the 42 other charges against him, including civil rights intimidation and 24 counts of aggravated assault.